'The Conners' renewal comes on the heels of an interview Barr gave blaming her show's demise on co-star Gilbert. Roseanne Barr is blaming yet another person for her downfall. 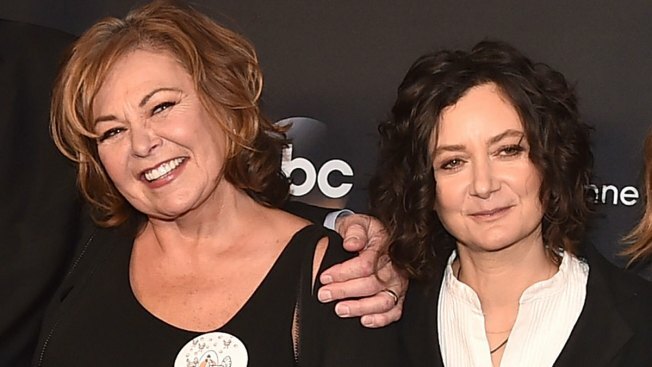 In a new interview with The Washington Post, the disgraced actress claims her former "Roseanne" co-star Sara Gilbert "destroyed" the show and her life after she publicly denounced Barr's racist comments about Valerie Jarrett. 'The Conners' aren't going anywhere. ABC has officially renewed the Roseanne spinoff for a second season. "We are proud to be continuing the story of the iconic Conners family," Karey Burke, president of ABC Entertainment, said in a statement. "This team is fearless in their willingness to tackle contemporary issues with humor and heart, and I have no doubt they will continue to outdo themselves." "The Conners" was born following the implosion of "Roseanne." The revived series hit ratings highs for ABC and was renewed for a second season. Then Roseanne Barr sent a racist tweet about Valerie Jarrett and Roseanne was canceled. ABC quickly went into salvage mode and worked out new deals with all involved, including Barr, who has no financial or creative ties to The Conners. The character of Roseanne Conner was killed off and John Goodman, Laurie Metcalf, Sara Gilbert, Lecy Goranson and Michael Fishman--all original stars of Roseanne--signed on for the new series. The renewal comes on the heels of an interview Barr gave the Washington Post blaming her show's demise on co-star Gilbert. A second season renewal came after new deals with the main cast. According to reports, Metcalf, Goodman and Gilbert are all making $375,000 an episode. In a release, ABC noted the cast for season two right now includes Goodman, Metcalf, Gilbert, Goranson and Ames McNamara with additional cast to be announced at a later date. Series regulars in the first season included Fishman, Emma Kenney, Jayden Rey and Maya Lynne Robinson.